1. Manufacturers of Class I, II and III medical devices will be required to assign unique identifiers to their products that are human and machine readable..
2. The UDIs will be required on all levels of packaging down to the lowest unit of use in both human and machine readable formats. This also includes direct part marking for certain devices. 3. Medical device manufacturers will also be required to submit data on their products to a global UDI database (GUDID) that will be available to the public and health care providers. However, the initial rule is just for product numbering (PI, DI) that is human and machine readable. 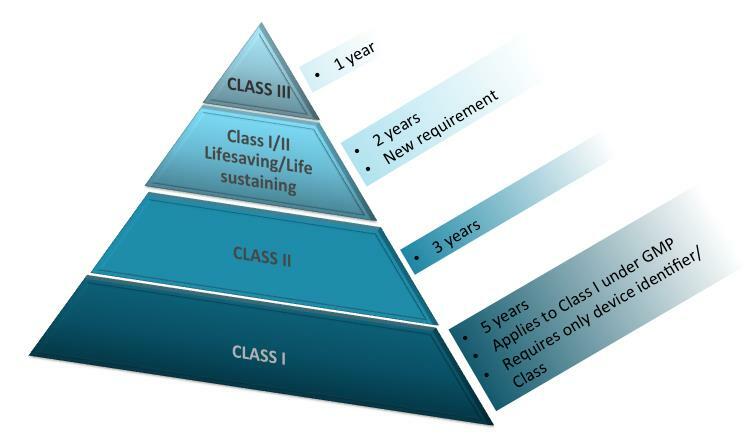 Medical devices deemed critical are subject to this mandate, starting with the most critical (Class III) and ending with least critical (Class I) devices. The UDI rule requires the most critical medical devices to uniquely identify and improve recall management and traceability, patient safety through effective adverse event identification (facilitate effective global reporting information), and device authentication (close the counterfeit in the supply chain). While the establishment of a UDI system will enable the healthcare industry to improve patient safety by facilitating more accurate adverse event reporting and recall management, the work of device enumeration and GUDID population is no simple task. Because most medical device manufacturers today use proprietary identifiers for their products, compliance with the FDA’s UDI requirements force them to invest heavily in a multitude of changes – from data used in both internal systems and external transactions, to the physical packaging and labeling of their devices. Furthermore, the FDA’s decision to make the GUDID available to the public shows its commitment to protect end-users. Some of the most critical medical devices have a complex web of sub-contractors, outsourced manufacturers, levels of distribution channel and finally health care providers leading to the final patient. There are many systems that are disparate, unique and disconnected that track these stages, however, they are not correlated. This leads to the issue of knowing where the final product is should there be a recall related to product quality, performance deficiency or adverse event. This end result of effective recall management and closing the counterfeit in supply chain in the name of public safety will take a long time as the initial requirements do not prescribe too well. But it is a good start, and full extended benefits will take time. Now the wait begins for the Office of Management and Budget (OMB) to clear the Final Rule (FR), so it can become the start of the implementation clock. Read more about UDI for medical device manufacturers and Sparta Systems’ UDI Submission Solution. Founded in 1994, Sparta is the world’s premier provider of cloud and on-premise quality management software. We offer the solutions, analytics, and expertise that speed up quality and compliance. Our QMS solutions help to lower risk, increase efficiency, and keep consumers safe while allowing manufacturers, suppliers, and distributors to collaborate in a seamless and integrated environment.